The United States is experiencing its worst jobs crisis since the Great Depression. Nearly 16 million Americans—our family, friends, and neighbors—are out of work. This national crisis demands a bold plan to put people back to work. 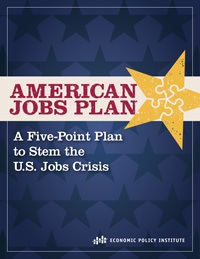 The Economic Policy Institute proposes the American Jobs Plan, a plan that would create at least 4.6 million jobs in one year. Here you will find EPI’s comprehensive research and analysis of the jobs crisis—how severe it has grown and why—and the details of EPI’s American Jobs Plan. We can—and must—put America back to work. EPI is a member of Jobs for America Now, a coalition of more than sixty groups working to put America back to work. For a complete list of participating organizations, visit Jobs4AmericaNow.org.